In a move that broadens Yahoo's (YHOO) relationship with Spain's largest operator network, the search company announced on Thursday an exclusive agreement with Telefonica Espana to power mobile searches and sponsored-search advertising on Telefonica's emocion mobile portal. The Telefonica Espana agreement, as well as Yahoo's plan to acquire Citizen Sports that it announced on Wednesday, is part of Yahoo's strategy to bolster its sponsored-search advertising business and throw more love at the content categories where it's strongest as it focuses on transforming into a media company. Yahoo has been selling off pieces of its business that are underperforming or aren't part of its core content areas of news, finance, entertainment and sports. When it comes to search, investors and industry-watchers will likely see more announcements where sponsored-search advertising is behind the deal, rather than landing the search business itself. Yahoo no longer views itself as a search company, after its agreement with Microsoft (MSFT) last year, in which the Redmond giant's Bing search technology will be integrated with Yahoo's search and take center stage. Further effects of that relationship were seen in last month's comScore survey, in which Yahoo's U.S. search market share fell to 16.8% from 17% in the previous month, while Microsoft's increased. Bringing the Web "to Consumers' Pockets"
The Telefonica Espana agreement enhances an earlier arrangement Yahoo struck with the Spanish telecom giant. 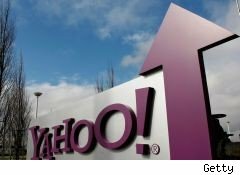 Under its 2007 deal, Yahoo!-branded search is the primary search service on Telefonica's mobile portals in the European and Latin America countries that it serves. Addressing the deal in a statement, Elisa Caballero, a Telefonica Espana general manager, said: "Our emocion portal brings the Web to consumers' pockets. A great mobile search service is a crucial part of that experience. By integrating Yahoo! 's mobile search experience, we are ensuring our customers have all the information they need at their fingertips." Yahoo's mobile search service aims to allow users to get info on sports teams, for example, and find the latest scores and team profiles and news. Sports is one of Yahoo's strong content categories. And as part of its efforts there, Yahoo plans to buy Citizen Sports, which delivers sports information to customers' social networking sites and mobile devices. The deal, which is expected to close in the second quarter, is designed to allow Yahoo! Sports to offer its customers the ability to broadcast their team allegiances and create or join a conversation with other fans or friends via Citizen Sports' applications. Terms of the Citizen Sports buyout were not disclosed. Citizen Sports customers currently use the service to play fantasy sports, checking live scores and accessing real-time sports news. Maybe it could be programmed to also keep track of Yahoo's dealmaking moves.